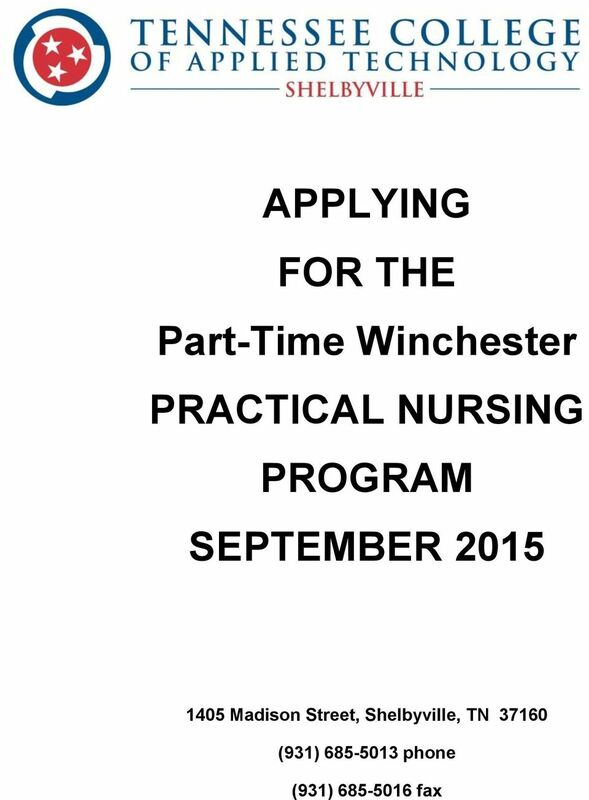 Download "APPLYING FOR THE Part-Time Winchester PRACTICAL NURSING PROGRAM SEPTEMBER 2015"
2 Tennessee College of Applied Technology/Shelbyville School of Practical Nursing 2015 Application Procedures Part-Time Winchester Class NOTE: All applications are handled through the main campus in Shelbyville by contacting the Student Services Department only. Failure to do so may result in your getting the incorrect information and could ultimately prevent you from entering the program (i.e. missed deadlines, etc.) Applications for one TCAT are not transferrable to another. Classes meet Monday through Thursday from 4:00 p.m. until 9:30 p.m. until clinicals begin. Once clinical practice has begun, the schedule will be two nights 4:00 7:00 p.m. and two nights 3:00-10:30 p.m. Regardless of where you live, travel is required to different sites for both clinicals and labs. Also, a computer with internet access is needed at home or access to one is needed. Step #1 Complete all Pre-Requisites. There are three pre-requisites for entrance into the Practical Nursing program in Winchester. There is no required order for completion. Failure to complete all three will result in you NOT starting the program. Pre-requisite #1 Schedule and take the COMPASS exam. You must come in person, complete a COMPASS Application and pay the $15 testing fee. A minimum score of 50 in Pre-Algebra and 80 in Reading is required. These are the only accepted components of the COMPASS test. 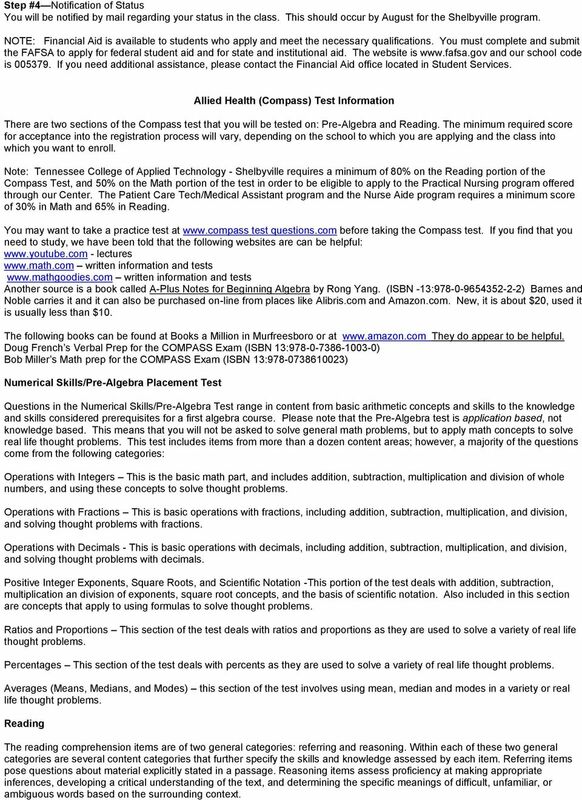 The COMPASS exam is used at the Tennessee College of Applied Technology as an entrance exam. We do realize that it is given at other institutions and used as a placement test, but that is not our purpose. Everyone (regardless of your education level) must take this exam. The only exception would be if you are under age 20 and have taken the ACT with no individual score below 19 and the composite score must be 19 or higher. An official copy of the scores must be submitted to us. Remember that higher COMPASS or higher ACT scores will be rewarded with higher point value in the application process. Studying for the exam is recommended. The first time the test is taken, you must take both the Math and Reading portion ($15 cash only). If a higher score is desired in a single area, you may take only one portion of the test. ($8 cash only) You must wait 30 days before retesting. Scores are good for two years. The COMPASS is a computer based test. It is not timed. If you need special accommodations and desire to take the test pencil and paper, you must have a doctor s documentation requesting such special accommodations. Check your schedule against the testing schedule before making your appointment. Once you ve made the appointment, if you have to change, you will be charged again. When you arrive to take the test, a valid picture ID is required before beginning the test. There will be no exceptions. Pre-requisite #2 Anatomy & Physiology (A & P) is required of all students entering the program. This must be completed prior to entering the program. If you have already taken A & P, your credits may transfer. We will accept an official transcript (only) from any Tennessee college or university that is SACS (Southern Association of Colleges and Schools) or COE (Commission on Occupational Education) accredited. It must indicate that a grade of B or above was achieved and that A & P 1 and 2 were completed no earlier than Spring of Students will be allowed to test out by successfully completing the HESI A & P test for the course. Applicants will only be allowed to take the test out exam one time. Cost will be $50 and a minimum score of 750 is required. Appointments must be made at least three weeks in advance. Applicants who take the test and do not pass will be required to take the class before continuing the application process. The Tennessee College of Applied Technology - Shelbyville will be offering Anatomy and Physiology as a night program in January, May and September. Check with Student Services for the current schedule. Pre-requisite #3 Math for Meds is required of all students entering the program. This must be completed prior to entering the program. The Tennessee College of Applied Technology - Shelbyville will be offering Math for Meds as a night program. Classes will meet one night per week for 3 hours for 13 weeks. Students will be allowed to test out by successfully completing the 100 question final for the course. Applicants will only be allowed to take the test out exam one time. Cost will be $50 and a minimum score of 80% is required. Applicants who take the test and do not pass will be required to take the class before continuing the application process. It is the responsibility of the applicant to make sure they have completed all prerequisites. TCAT Shelbyville will not notify you of schedules or impending deadlines. PLEASE NOTE: Completion of all three pre-requisites does not guarantee entrance! 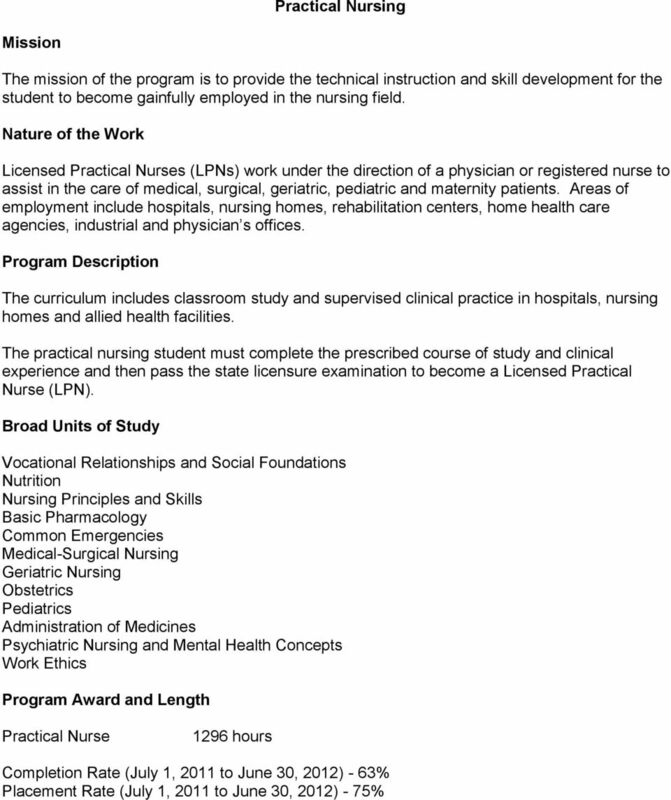 Step #2 Apply to the Practical Nursing Program (this is the second required application) Part-Time Winchester Classes begin September 2015 Students will be notified to attend an information session only if they have completed all three pre-requisites (see Step #1 above). There may be more than one session, but is imperative that you attend on the date assigned. Seating will be limited. Failure to attend the information session will prevent you from completing the application process and prevent you from beginning the program. The information sessions will take place during the month of June. Step #3 Acceptance Standards Each applicant will be evaluated according to the COMPASS scores, educational history, work history and reference questionnaires. Not everyone who applies will be accepted into the program. Persons not accepted into the program will have to re-apply to be considered for future programs. 3 Step #4 Notification of Status You will be notified by mail regarding your status in the class. This should occur by August for the Shelbyville program. NOTE: Financial Aid is available to students who apply and meet the necessary qualifications. You must complete and submit the FAFSA to apply for federal student aid and for state and institutional aid. The website is and our school code is If you need additional assistance, please contact the Financial Aid office located in Student Services. Allied Health (Compass) Test Information There are two sections of the Compass test that you will be tested on: Pre-Algebra and Reading. The minimum required score for acceptance into the registration process will vary, depending on the school to which you are applying and the class into which you want to enroll. 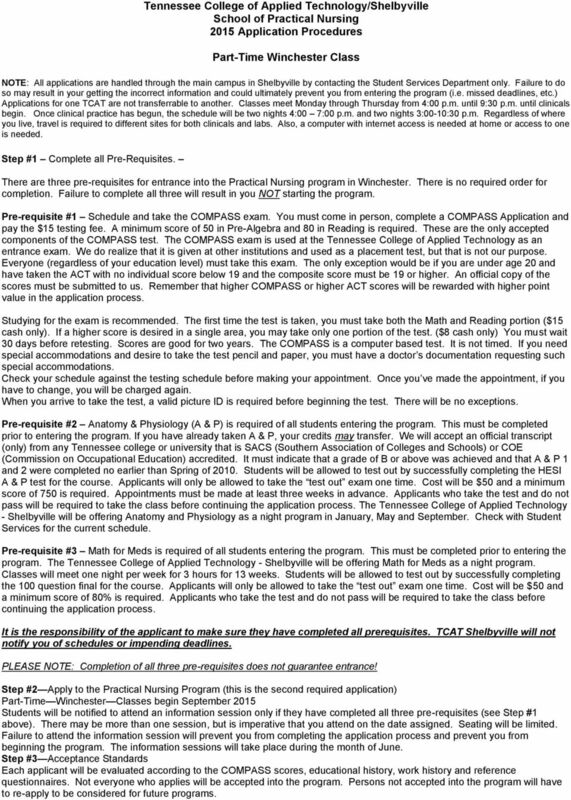 Note: Tennessee College of Applied Technology - Shelbyville requires a minimum of 80% on the Reading portion of the Compass Test, and 50% on the Math portion of the test in order to be eligible to apply to the Practical Nursing program offered through our Center. The Patient Care Tech/Medical Assistant program and the Nurse Aide program requires a minimum score of 30% in Math and 65% in Reading. You may want to take a practice test at test questions.com before taking the Compass test. If you find that you need to study, we have been told that the following websites are can be helpful: - lectures written information and tests written information and tests Another source is a book called A-Plus Notes for Beginning Algebra by Rong Yang. (ISBN -13: ) Barnes and Noble carries it and it can also be purchased on-line from places like Alibris.com and Amazon.com. New, it is about $20, used it is usually less than $10. The following books can be found at Books a Million in Murfreesboro or at They do appear to be helpful. Doug French s Verbal Prep for the COMPASS Exam (ISBN 13: ) Bob Miller s Math prep for the COMPASS Exam (ISBN 13: ) Numerical Skills/Pre-Algebra Placement Test Questions in the Numerical Skills/Pre-Algebra Test range in content from basic arithmetic concepts and skills to the knowledge and skills considered prerequisites for a first algebra course. Please note that the Pre-Algebra test is application based, not knowledge based. This means that you will not be asked to solve general math problems, but to apply math concepts to solve real life thought problems. This test includes items from more than a dozen content areas; however, a majority of the questions come from the following categories: Operations with Integers This is the basic math part, and includes addition, subtraction, multiplication and division of whole numbers, and using these concepts to solve thought problems. Operations with Fractions This is basic operations with fractions, including addition, subtraction, multiplication, and division, and solving thought problems with fractions. Operations with Decimals - This is basic operations with decimals, including addition, subtraction, multiplication, and division, and solving thought problems with decimals. Positive Integer Exponents, Square Roots, and Scientific Notation -This portion of the test deals with addition, subtraction, multiplication an division of exponents, square root concepts, and the basis of scientific notation. Also included in this section are concepts that apply to using formulas to solve thought problems. Ratios and Proportions This section of the test deals with ratios and proportions as they are used to solve a variety of real life thought problems. Percentages This section of the test deals with percents as they are used to solve a variety of real life thought problems. Averages (Means, Medians, and Modes) this section of the test involves using mean, median and modes in a variety or real life thought problems. Reading The reading comprehension items are of two general categories: referring and reasoning. Within each of these two general categories are several content categories that further specify the skills and knowledge assessed by each item. Referring items pose questions about material explicitly stated in a passage. Reasoning items assess proficiency at making appropriate inferences, developing a critical understanding of the text, and determining the specific meanings of difficult, unfamiliar, or ambiguous words based on the surrounding context. 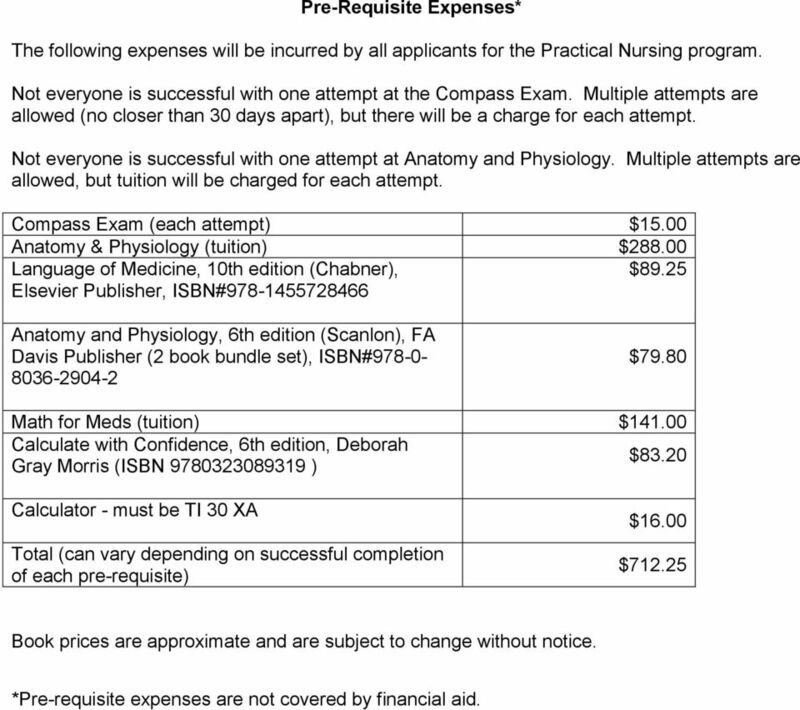 5 Pre-Requisite Expenses* The following expenses will be incurred by all applicants for the Practical Nursing program. Not everyone is successful with one attempt at the Compass Exam. Multiple attempts are allowed (no closer than 30 days apart), but there will be a charge for each attempt. Not everyone is successful with one attempt at Anatomy and Physiology. Multiple attempts are allowed, but tuition will be charged for each attempt. Compass Exam (each attempt) $15.00 Anatomy & Physiology (tuition) $ Language of Medicine, 10th edition (Chabner), $89.25 Elsevier Publisher, ISBN# Anatomy and Physiology, 6th edition (Scanlon), FA Davis Publisher (2 book bundle set), ISBN# $79.80 Math for Meds (tuition) $ Calculate with Confidence, 6th edition, Deborah Gray Morris (ISBN ) $83.20 Calculator - must be TI 30 XA Total (can vary depending on successful completion of each pre-requisite) $16.00 $ Book prices are approximate and are subject to change without notice. *Pre-requisite expenses are not covered by financial aid. 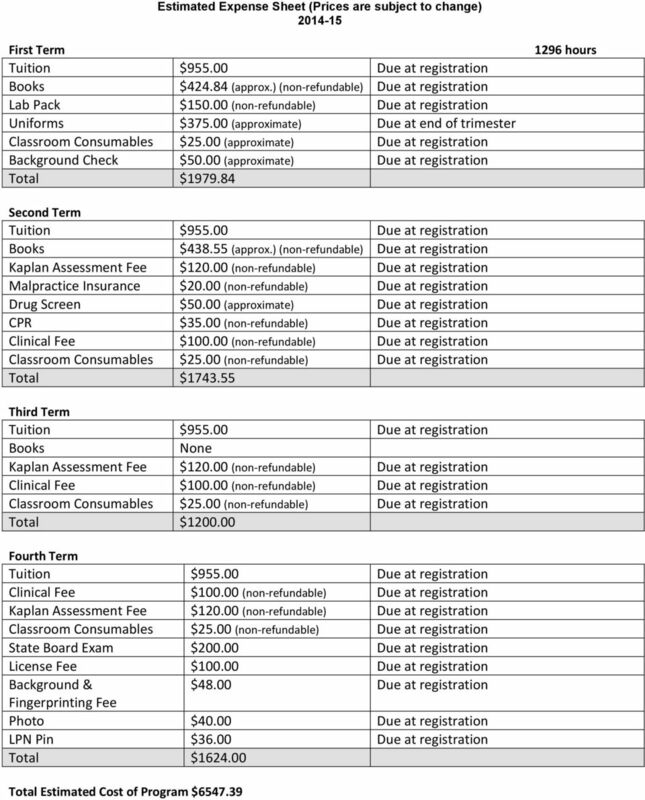 Medical Assisting Admissions Requirements 2014-2015 2 HEALTH PROGRAMS ADMISSIONS REQUIREMENTS Below are the general admissions requirements for all health programs followed by the program specific requirements. Practical Nursing Admissions Requirements 2014-2015 HEALTH PROGRAMS ADMISSIONS REQUIREMENTS Below are the general admissions requirements for all health programs followed by the program specific requirements. 2013 Spring/Summer Exam Schedule Nursing (NLN), Allied Health (HP-A2), LPN-RN Progression (HESI) 9:00 a.m. 11:00 a.m. 9:00 a.m. 11:00 a.m.
3. Achieve a grade of C or higher in all required general education courses. CARING COMPETENCE. What is an Associate Degree Nursing Program? 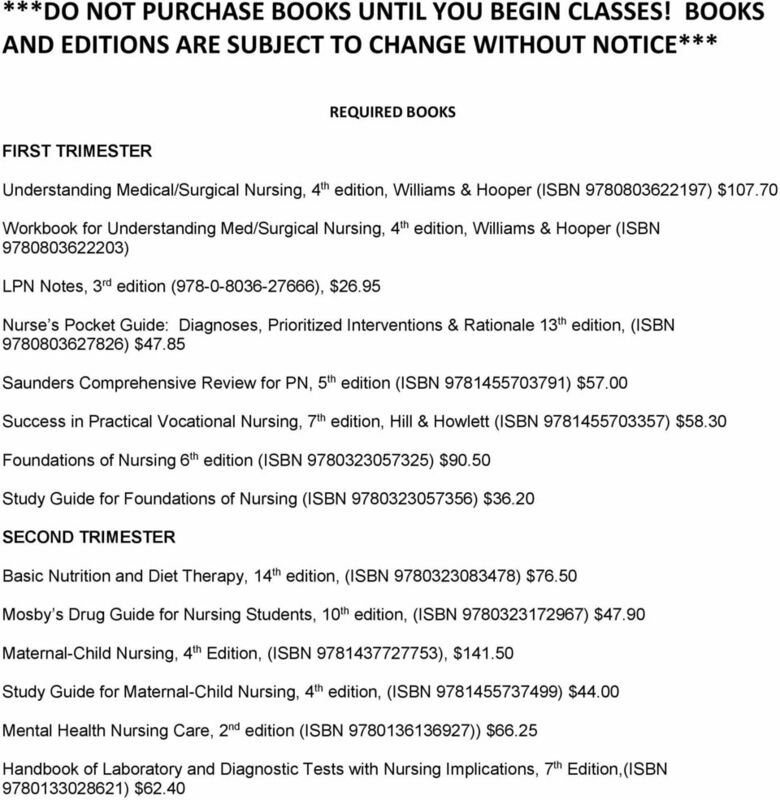 2015-2016 LPN/LVN Curriculum Catalog. Delivering solutions to support your program goals.